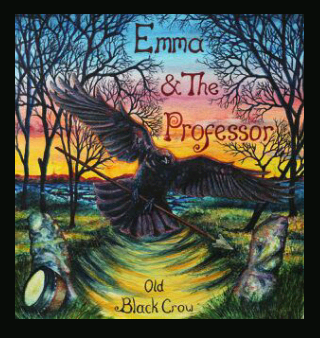 Old Black Crow is the latest high-energy musical offering from Shropshire couple Emma Heath (guitar and vocals) and Mark Davies (bodhrán and Cajon). The duo is joined by an impressive array of guest musicians including Benji Kirkpatrick (banjo and bouzouki); Ben Walsh (fiddle); Jack Rowe (fiddle) and Marion Fleetwood (fiddle and string arrangements). Many of the songs are self-penned and inspired by the ancient history and beauty of the couple’s native Shropshire. Emma has a rich and powerful voice and driving guitar style while Mark’s no-nonsense bodhrán playing roots the music and sets its direction. The end result is an uplifting and exciting listening experience. Right from the opening title track it is clear that this is an album of full-throttle songs! ‘Old Black Crow’ is a rockin’ bluesy romp, driven along nicely by Benji Kirkpatrick guesting on banjo. Mark’s ‘Battle Of The Marches’ features Kirkpatrick on bouzouki and tells tales of the mysticism that lies in the hills of the duo’s native Shropshire. This is no wimpy fairy story, more a full-on battle of Middle-earth epic proportions! The beautifully sensitive ‘Servant Slave’ is of marked contrast. With its Middle-Eastern overtones reinforced by Kirkpatrick’s bouzouki, here Emma’s voice is showcased to good effect. The traditional American murder ballad ‘Rain And Snow’ is given a makeover, with impressive fiddle provided by Jack Rowe. The concluding ‘Rivers’ is like an Indian Raga, Emma harmonising with herself across Mark’s driving rhythm section. Old Black Crow radiates with the energy that lies within the ancient lands of the Welsh Marches. Here are tales of sorrow, loss, hope and love all delivered with deep passion and soul. …one of the band’s members, Dan Rubin, contacted me in search of some information. It’s a bit outside my sphere of knowledge (and a bit too far East for me geographically), but perhaps someone who reads this blog – there must be someone! – will have some ideas. … I live in Pouch Cove now, a small community north of St. John’s, which is the closest town in continental North America to Europe. The influence of Devon is strong here. I bought and now live in a house built by Henry Langmead, whose family arrived from the West Country in the late 1800s, or perhaps earlier. Henry (known locally as Harry) was our last traditional mummer who practiced a tradition known as the Ribbon Fools. These people dressed up in white clothes adorned with multi-coloured ribbons, and created ornate and very scary masks to hide their faces. Unlike the Irish Jannies who went from house to house during Christmas, often cross-dressed, disguised and playing instruments, the Ribbon Fools would appear between Christmas and Old Christmas Day (the eighth of January) and would chase anyone they caught down the road, trying to whip them with the end of a rope. I helped start our town’s Heritage Society, and have been trying to research this tradition for some years. But the leads are few. I have seen pictures of Morris Dancers with similar costumes, including some in a book that Sally lent me. But I would like to know more specifically where this tradition originated, and whether it has roots in Devon and the surrounding area. If you can assist me in finding out more, that would be wonderful. It would be another strong link between Devon and Newfoundland. If you have any ideas, I’d be grateful if you would leave a comment to this post or use the contact form.